Northway Primary School believes that all children should have a well-rounded education. Mindfulness is a modern life skill where children learn how to live in the ‘now’ and to be aware of the present moment. This enables our pupils to notice their thoughts and emotions, and identify a difference between impulses and actions. Regular mindfulness practice can help us ‘step back’ from situations and act with clarity, wisdom and perspective, rather than simply reacting in the heat of the moment. We are more able to focus on solutions rather than problems and to manage conflict and stress more effectively. 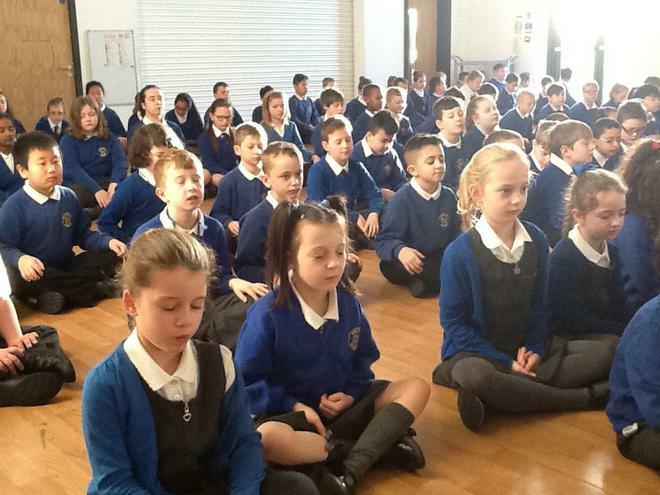 Children at Northway now take part in Mindfulness throughout their school day in order to improve emotional health and well-being. Mindfulness activities at Northway focus on breathing techniques. Children learn to focus their minds through whole class guided breathing, guided relaxation and circle time discussions. Research links mindfulness to an increased ability to concentrate during learning times and greater resilience in social situations. We have already seen improvements in managing behaviour and in children’s ability to deal with difficult situations. Our Mindfulness initiative links closely to Northway’s Growth Mindset approach to learning, which enables our children to learn in an environment that encourages perseverance, mistake making, challenge and ultimately deeper learning. If you would like to know more about Mindfulness at Northway take a look at the links below. You can also pass any questions on to Miss McLachlan who will be happy to talk to you about the benefits we have seen since introducing the initiative. There will be a Mindfulness workshop for parents taking place early in the spring term. In this ITV News item http://www.itv.com/news/wales/update/2013-12-08/new-mindfulness-techniques-used-in-schools/ you can hear pupils speaking movingly about their experiences of developing mindfulness skills. The government’s Mindful Nation UK report has been released and contains a section on the role of mindfulness in education.